About Us | Citrolim, S.A. de C.V.
James M. Readhimer, Citrolim’s founder, is in his fifth decade of involvement in the citrus industry. His farming roots in Texas and Mexico eventually led to the launch of his first lime-production business in 1971, and Citrolim is the latest incarnation of that effort. Readhimer remains active in Citrolim’s operations, with day-to-day business now in the care of the next two generations of his family. Citrolim’s administrative and operations personnel draw from hundreds of years of combined experience in the citrus industry in providing the highest quality products and customer service in the business. Citrolim’s technical expertise is peerless in the lime processing field and provides customers with unmatched value when paired with its commitment to service. The location of Citrolim’s production facility in Mexico’s Key lime growing region gives it access to the best quality limes at the most competitive prices. The facility’s proximity to Pacific Ocean ports and overland transit connections provide for efficient shipping worldwide. Citrolim’s unparalleled customer service, strong and personal business relationships and exacting standards for its products make it uniquely positioned to serve any need for lime flavorings in the food and beverage industry. 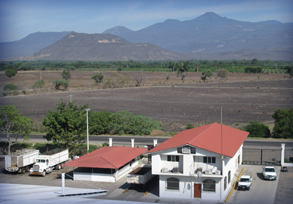 Citrolim’s production facility in the shadow of mountains near Apatzingan is located close to some of the most productive lime orchards in Mexico, enabling the company to buy the best quality fruit at the most competitive prices. 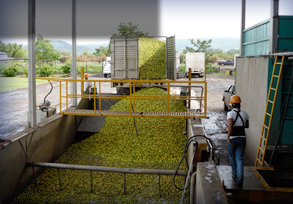 The fruit Citrolim buys from Mexican farmers goes straight from the farmers’ trucks into the first stage of a washing system. Team Citrolim at the production facililty. copyright © Citrolim, S.A. de C.V.